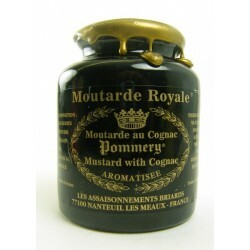 For those that like it hot and posh - rich whole grain mustard spiked with French Cognac. Great with rare beef, game or your Christmas bird. Pommery Meaux mustards has been served at the tables of French Kings since 1632. The secret recipe belonged to the religious order of Meaux and was passed on to the Pommery family in 1760 who, to this day, closely guard its secret recipe. This deliciously grainy mustard is spiked with cognac for a condiment that goes very well with rare beef, game, goose and duck.